It's important to repair and recharge when you need to. 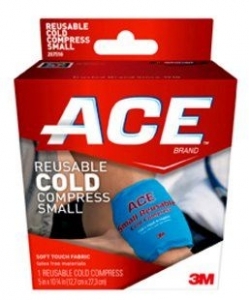 ACE™ Brand Reusable Cold Compresses feature a soft touch fabric that conforms to the body and offers soft, comfortable cold therapy. Get fit for battle and back in the game with ACE relief. Keep compress in freezer between applications. To clean, wash in lukewarm water and air dry. Discard if punctured or torn. Apply directly to injured area, no towel or cover needed. Leave in place for no longer than 20 mins. Remove compress and return to freezer for at least 30 minutes before reapplying. Always return to freezer promptly for fastest reuse. Do not heat cold pack in microwave. Do not sit or lean on compress, excessive weight may cause compress to rupture and leak. If condition persists, consult a physician. 5in X 10 3/4in . Soft touch fabric.